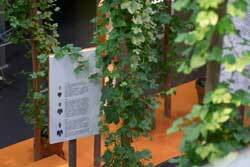 Enter the exhibition through the world’s largest hop cone and learn about the importance of hops for human beings. A model of a landscape will lead you to the times of the migration periods, when hop was still a wild-growing medicinal plant. 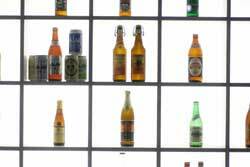 Visitors can look for traces of hop’s history from all over Germany on an “interactive map“. When considering the medieval history of hops, the focus is on the oldest documents about hop growing, the famous Bavarian Purity Law of 1516 and the botanical writings of Hildegard of Bingen. In a library from the Age of Enlightenment you will learn how hops were discovered and promoted as a guarantee for prosperity. A real “hop rush” was released during the Industrial Revolution in the 19th century. Here you can marvel, for example, at the reconstructed model of the hop pickers’ fountain in Fürth. In present times, significant changes were caused by mechanization. The key feature is the hop picking machine, being the biggest and most expensive agricultural machine of all times. The museum’s own “Iron Picker” was refurbished and is now ready again for special demonstrations.